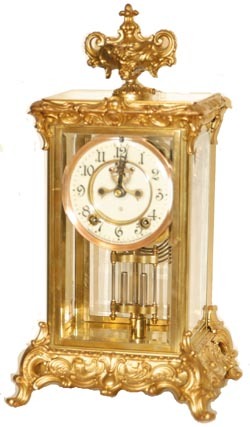 Ansonia Clock Company, crystal regulator, "Crown", C. 1914. Case is polished brass, ornaments redone with gold, case is 15.5" high. The 2 jar, imitation mercury pendulum, 2 piece porcelain dial, and the hands are all near perfect. 8 day movement has been cleaned and is running fine, strikes a standing cathedral gong on the half hours. This is a very nice crystal regulator. Ly-Ansonia #357.